A few mornings ago, I awoke to find this feathered friend tethered to the desert floor by a slender black thread. The thread was seriously fouled around the left claw of the little fellow and he was stuck good. Made curious by his seemingly strange antics, I approached him carefully. Initially, I didn’t realize he was a prisoner. He was hopping around when I drew near to him and as I came closer I realized he was definitively caught. Moreover, this little guy was clearly eager to be released from his mooring line. I carefully picked up this fragile sparrow and gently severed the thread holding him fast to the ground. Noticing the thread entwined his claw and knotted it up like an old arthritic hand, I decided simply releasing him without removing the twisted thread would be imprudent. I brought him back to base camp for advanced procedures. Using scissors, tweezers, and finger nail clippers, I delicately cut away the threads tangled around his claw. A few things struck me most profoundly about this encounter. First, the little bird, after some slight initial reluctance, settled quite comfortably into my hand and allowed me to gently cut away the knotted thread. He almost became docile to my ministrations. As I experienced this docility, I thought to myself if only we would let go and allow God to cut away the tethered threads of lack of love that limit our ability to soar. Second, I had never been so close to a bird’s claw and was captivated by its complexity and its seeming fragility. How wonderfully made we are! I paused in quiet awe. Next, I found myself deeply aware of this little sparrow’s beating heart. Oh how rapid it was as it beat against my palm. Knowing I could easily crush this little bird, the fragility of life and its attendant beauty struck me deeply. Again, I paused in awe. As I was cutting away the threads that bound our little sparrow, these words came to my heart. Seeing this little bird caught fast by a gossamer thread and knowing I only wanted to help him fly, helped me to better understand the teaching of St. John of the Cross. This encounter was no small event for me. 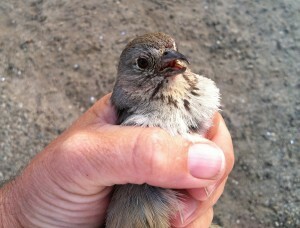 I was really touched by this little sparrow and my chanced meeting the other day in the desert. It seems to me, we are called to be helpful to other beings not simply because it is good for them but also because we become transformed in the process of helping. At the end, the little bird chirped a happy song and flew away. As for me, I spent the rest of the week deeply moved by this encounter. Some days later around 2:30 in the morning, I was awakened by a little songbird singing outside my window. I thought to myself, “Gee, little bird it’s too early in the morning for you to be awake. Why are you not sleeping like all the other birds?” I then thought perhaps this was my little friend released from his bonds and healed from his wounds returning to offer me an early morning song of thanks. Who knows! This encounter with the tethered sparrow happened a few days ago and yet the joy of that moment lingers. Life is good. Rich. Beautiful.